British Columbia (BC) Alberta (AB) OTHER CHARGES (Within Canada Only):Province - GST/HST Rate (%) Mounting Hardware Included. Tilted design makes guitars safe from falling. Turn your guitar into a showpiece and avoid cluttering your floorspace with the Fender wall hanger. NEW - FENDER WALL HANGER. All mounting hardware included. Other alphabets (Cyrillic, Japanese, Chinese, etc.) will not be translated and your item will be delayed. Want an elegant, convenient way to showcase your favorite guitar or bass?. 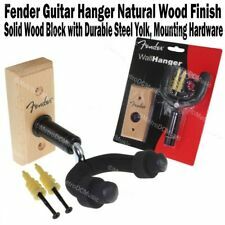 Fender's Hanging Display Stand is also safe for nitrocellulose laquer finishes. NEW - FENDER HANGING WOOD GUITAR STAND. Fender Hanging Guitar/Bass Display Stand Features at a Glance. Trending at C $36.03eBay determines this price through a machine-learned model of the product's sale prices within the last 90 days. Along with being portable and efficient, the stand's padded yokes are perfect for guitars with sensitive finishes, such as nitrocellulose. Height-adjustable neck yoke. Fender Deluxe Hanging Guitar Stand. NEW - FENDER THE ARCH WORKSTATION. The Arch Workstation is a convenient solution that makes it easy to. ultra-stable The Arch neck rest, which is made of nitro-safe TPE rubber and. modifications to a guitar in the field can be challenging without the right. Turn your guitars into showpieces and avoid cluttering your floor space with Fender wall hangers. Each hanger is not only crafted from quality long-lasting materials but is available in three colors and finishes tailored to your preferences or personal style. Strings were cleaned and are in good condition. Image with blue circle shows how the rusted areas look after having been cleaned. Price has been accommodated. - 6 Fender guitar strings (.053 to. 012 gauge). Fender stage 3 guitar stand case Tweed!. Note the extra utility compartment! Condition is Used. Shipped with USPS Parcel Select Ground. Turn your guitar into a showpiece and avoid cluttering your floorspace with the Fender wall hanger. 3-TONE SUNBURST. 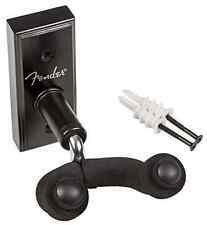 NEW - FENDER WALL HANGER. All mounting hardware included. Other alphabets (Cyrillic, Japanese, Chinese, etc.) will not be translated and your item will be delayed. Fender 3 Guitar Case Stand Portable Black Brief Style Case - Black , New!. Condition is New. Shipped with USPS Priority Mail. NEW - FENDER 5-GUITAR FOLDING GUITAR STAND. Other alphabets (Cyrillic, Japanese, Chinese, etc.) will not be translated and your item will be delayed. We do not accept wire transfers. A broken string is not considered to be a "defective" product and/or "not as advertised". Holds most standard shape guitars (non-offset). Acoustic Electric Guitars. Electric Guitars. We hope that in most cases, this expedited order processing works in your favor, but we regret that it can make it very difficult to honor cancellation requests. Redesigned in a striking cherry or piano black gloss finish on beech wood, Fender’s Hanging Display Stand is an elegant, convenient way to showcase your favorite guitar or bass. (Guitar not included). See All Photos For More Details. NEW - FENDER DELUXE HANGING GUITAR STAND. Other alphabets (Cyrillic, Japanese, Chinese, etc.) will not be translated and your item will be delayed. We do not accept wire transfers. Redesigned in a striking cherry or piano black gloss finish on beech wood, Fender’s Hanging Display Stand is an elegant, convenient way to showcase your favorite guitar or bass. Solid beech wood construction. Available in a striking cherry or piano black gloss finish on beech wood, Fender's Hanging Dual Display Stand is an elegant, convenient way to showcase your favorite guitars or basses. Solid beech wood construction. Acoustic Guitars. Acoustic Electric Guitars. Stylish yet compact, the Fender Mini Stand is sturdy enough to firmly hold an acoustic guitar but folds down to fit in most gig bags or cases. Fender Mini Acoustic Guitar Stand. This Fender Multi Folding Guitar Stand will keep your guitars and basses ready and at hand easily, conveniently, and safely. This model will hold 3 acoustic or electric guitars or basses (as shown) and folds up neatly and compactly. NEW - FENDER UNIVERSAL GUITAR STAND. Other alphabets (Cyrillic, Japanese, Chinese, etc.) will not be translated and your item will be delayed. We do not accept wire transfers. Fender's adjustable guitar stand conveniently showcases your acoustic, electric, or bass guitar. NEW - FENDER ADJUSTABLE GUITAR STAND. Other alphabets (Cyrillic, Japanese, Chinese, etc.) will not be translated and your item will be delayed. Height-adjustable neck yoke. Along with being portable and efficient, the stand's padded yokes are perfect for guitars with sensitive finishes, such as nitrocellulose. Fender's Hanging Dual Display Stand is an elegant, convenient way to showcase your favorite guitars or basses. NEW - FENDER HANGING WOOD DOUBLE GUITAR STAND. Other alphabets (Cyrillic, Japanese, Chinese, etc.) will not be translated and your item will be delayed. Available in a striking piano black gloss finish on beech wood, Fender's Hanging Dual Display Stand is an elegant, convenient way to showcase your favorite guitars or basses. A broken string is not considered to be a "defective" product and/or "not as advertised". Acoustic Guitars. Acoustic Electric Guitars. Stylish yet compact, the Fender Mini Stand is sturdy enough to firmly hold an acoustic guitar but folds down to fit in most gig bags or cases. A broken string is not considered to be a "defective" product and/or "not as advertised". Its stepped yoke design fits solid body electric guitars and basses as well as larger hollow body acoustic, semi acoustic, and everything in between. Fender's new Acoustic and Electric Mini Guitar Stand follows the tradition of the already legendary Mini Guitar Stand series. 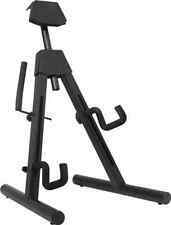 NEW - FENDER 3-GUITAR FOLDING GUITAR STAND. Other alphabets (Cyrillic, Japanese, Chinese, etc.) will not be translated and your item will be delayed. We do not accept wire transfers. Available for three or five guitars. It folds up really small so that you can carry it in your guitar case, gig bag or tuck it in the back of your amp, but when you open it up it will securely and stably hold your guitar or bass with rock solid performance! New Fender Make History Mini Guitar Stand Acoustic Model # FMSA-1 Fast shipping Condition is New. Shipped with USPS Priority Mail. Turn your guitars into showpieces and avoid cluttering your floor space with Genuine Fender wall hangers. Each hanger is not only crafted from quality long-lasting materials but is available in three colors and finishes tailored to your preferences or personal style. 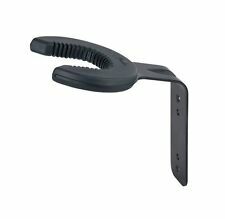 NEW - FENDER FMSE-1 MINI ELECTRIC GUITAR STAND. These great little stands are sturdy enough to firmly hold your electric guitar but folds down to fit in most gig bags or cases! Holds most standard shaped electric non-offset guitars. Fender’s adjustable guitar stand conveniently showcases your acoustic, electric or bass guitar. These great little stands are sturdy enough to firmly hold your acoustic guitar but folds down to fit in most gig bags or cases! Holds most standard shaped acoustic guitars. 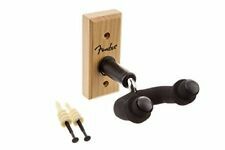 NEW - FENDER FMSA-1 MINI ACOUSTIC GUITAR STAND. fender guitar stand Condition is Used. Shipped with USPS Parcel Select Ground (2 to 9 business days). These great little stands are sturdy enough to firmly hold your electric guitar but folds down to fit in most gig bags or cases! Holds most standard shaped electric non-offset guitars. Other alphabets (Cyrillic, Japanese, Chinese, etc.) will not be translated and your item will be delayed. 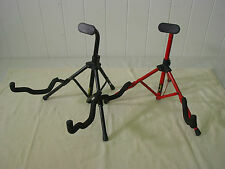 Fender Electric Guitar Folding Stand. This great little stand is sturdy enough to firmly hold your favorite guitar, but folds down to fit in most gig bags or guitar cases. Holds most standard-shaped electric guitars (non-offset).